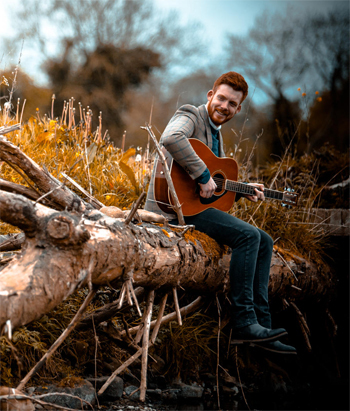 Houston Music Reviews.com - Your source for Houston Quality Music Interview with Irish/Folk/Americana singer and songwriter Pat Byrne. 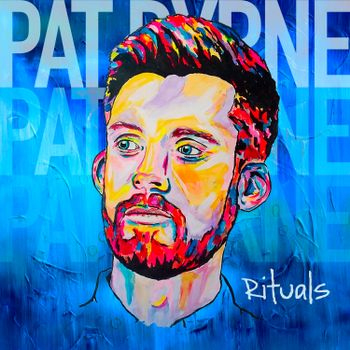 Pat Byrne is an Irish singer and recording artist, currently residing part-time in Austin, Texas. 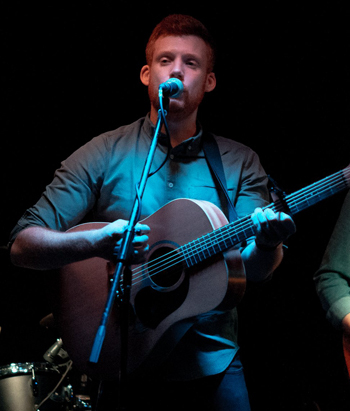 His style is described as "Roots Americana with an Irish twist". Alexander Dorian had the pleasure to interview Pat at his first U.S. show in support of his new LP “Rituals” (Jan. 10, 2018 @ McGonigel's Mucky Duck, Houston, TX). Alex Dorian: I've read on your Wiki page that you started out as a punk rock drummer. If you don't mind quickly taking our readers from that period up until the time that you won “The Voice of Ireland” in 2012. Pat Byrne:My Wikipedia is kind of funny because after I won “The Voice” my friend hijacked it and edited it. It is true, we were in a punk band together, thus he focused heavily on that period. When I was a kid I started out in the local orchestra, I played violin, clarinet and piano. None of them stuck, so eventually I bought a drum kit and taught myself. I joined the local punk band, as that was the only band in the area. I had so much fun doing that all the way through my teens, but got sick of lugging drums around to all the gigs. My dad did too, so he bought me a guitar when I turned fifteen, and I just taught myself. One day I started singing in my bedroom and worked up the courage to sing in public. 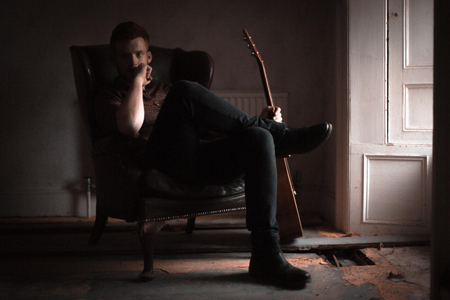 At age seventeen I began gigging in local pubs, and it’s the only job I've had since. Then it evolved into me writing my own stuff. As far as the “Voice of Ireland”, I've never been a fan of reality TV, so I'm not incredibly proud of being on it, although it was a great opportunity and it worked wonders for my career. A.D.: To be able to win against all these other people and go all the way to the top is quite an accolade. P.B. : That's it! I didn’t love university, so my only option was to have a career in music. So, kind of as a desperate attempt to have easy access to lots of work, I went on “the Voice”. Never thought I'd win it, more that I'd maybe get some exposure and gigs out of it. I ended up winning it, which was unbelievable; it was great fun. Obviously, I was very humbled to have come first out of all those thousands of people. A.D.: Did you consider yourself a singer/songwriter by the time you appeared on “the Voice”? P.B. : I'd been writing a bit, but nothing I thought was good. I knew I could sing, but at that point I didn’t consider myself a songwriter. I'd mostly done gigs in bars covering songs. I was twenty years old and very much a young man, enjoying life. But then after “the Voice”, because I won, I got a contract and was sent to London for four months to write and record an album with these amazing industry writers that wrote hit singles for Enrique Iglesias, Cher and all these huge names. It was a great opportunity to sit with people that have perfected their craft and have made lots of money writing songs for big names. While the album that came out had some great songs, it wasn't my cup of tea. It was written in a hurry, and the label was targeting fifteen year-old girls. I co-wrote on some of the songs, but I didn’t have much artistic control. So, I wasn't hugely proud of that album, although it sounds totally fine. I felt like I was singing someone else’s story. So that tour didn't last long, and ultimately it was kind of a flop. 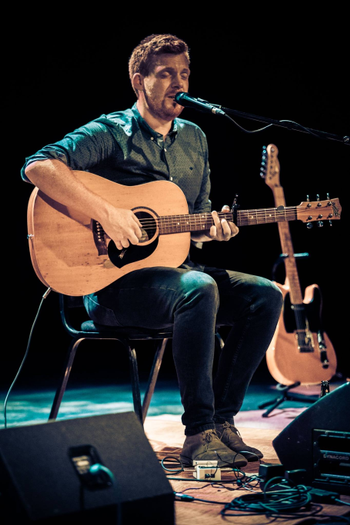 I lost a lot of confidence for a while, and turned into myself, and started doing the gigs I'd been doing before – the weddings, the parties and the pubs. Still, spending time with those writers helped me learned some techniques, and I started writing a lot myself. Spent five years keeping my head down, trying to lose “the Voice of Ireland” tag. That's a bit of a stigma, and it’s hard to shake. You're always “the Voice”, rather than just an artist, who writes songs and sings. I laid low for a few years, then last year moved here (Austin, TX) to write and record my own stuff, and now I feel like I’m taking myself more seriously. A.D.: What is the first song that you learned? A.D.: What challenges did you face as both a singer and guitarist at same time? P.B. : For me that all happened at the same time. I don't consider myself a particularly amazing guitar player; I see that as a way to complement my voice. As soon as I picked up the guitar, I taught myself chords and the only enjoyable way to play the guitar for me is to sing over it, so that's the way it happened. I never found it difficult to do both at the same time, I was a drummer, and (on drums) you use everything at once, so I don't find it hard to sing and play, that came very naturally. A.D.: How did you discover your singing voice? P.B. : I never thought of myself as a good singer when I started. My voice broke when I was very young, so I've always had this deep raspy voice, and I leaned to sing a lot of Johnny Cash. I sang in public and people were complementary. But, honestly after I won “the Voice”, I considered that maybe I was good and I had something. Genuinely it wasn't until then that I thought that I was a good singer. Generally I saw myself as being able to have some fun in a pub and get people singing along. Getting that accolade from other people, being crowned “You're the Voice” makes you believe “ok, yeah, I am able to sing”. A.D.: As you mentioned starting in pubs, you're from a remote part of Ireland, could you tell us us a bit about that? P.B. : I’m from a small village called Borris, County Carlow, in the southeast of Ireland. It is a very small rural community. I was the only singer. I sang in all the pubs, at all the Christenings, funerals and weddings. That made me a well-known figure from where I’m from. I was lucky to be in such a small place, yet have enough work to put myself through college and make a living. A.D.: Your bio mentions collaboration with Allan Downey from Aslan, any chance the American audience will get to see that? P.B. : That’s a sad story. Aslan are huge in Ireland. Aslan's singer got cancer five years ago; they couldn't gig and all they've known was life on the road. When he got cancer, the band fell apart. I met up with Alan, who was the drummer in Aslan, and we just gigged for fun. We were successful, but it was not an original project or anything. Still, he's a great friend of mine and we spent four years doing weddings and corporate events together. I wouldn't call it collaboration, but it was certainly a good experience and I learned a lot about the business side of music. It is cool that I've played with him as he is a legend in Ireland. A.D.: In your bio, you mention that “Rituals” is the first LP that you have full control of. What did you do different this time around, how would you compare that to previous releases? P.B. : As I said, I was thrown in with lots of songwriters last time around; they pretty much wrote for me, and with me. This time everything is me. I sat down for about a month by myself, at a little lake house in the Texas Hill Country, wrote all the songs, made demos on my laptop and then recreated the demos with great musicians in Austin and in Dublin. It came right from me, and I had artistic license on the whole process. I can't say that for the last one. This is more of me, and I took the time to get it right. A.D.: What is the Pat Byrne sound to you? How do you describe what you do? P.B. : My heroes are Bruce Springsteen, Bob Dylan, Tom Waits, Van Morrison and Paul Simon. I like to make my songs fun, I like to have good lyrical content, to be musically credible and have integrity. That's what I try to do. Genre-wise I would probably call it Americana to Folk. It varies from song to song. There's a song that is very traditionally Irish, “The Hills of Killedmond.” I love Irish music. One song is a full-on Pop; then there is another song that is more Rock. A.D.: What made you move to Austin, TX? What is the biggest difference between Ireland and Texas as you see it? P.B. : I met Ted (my manager) in 2012. After “the Voice”, I was sent to England to do an album, and Ted lived in the same village where I was writing and recording, on the outskirts of London. I became great friends with him, his wife and daughter, because we were all blow-ins. He’s from Texas. We became good friends and we stayed in touch. January, maybe four years ago, I was traveling in the States. I sent a text to Ted, and he invited me to visit. I fell in love with Austin, and actually got to sit in with the musicians I played with here tonight. I thought I'd love to live here and play good music to people who love to hear it. Which is quite unique compared to where I’m from. In Austin, when I’m finished performing, I go watch other amazing artists; every bar is a great venue, and everyone is super talented, so I made it my goal to move here. That's what I've been trying to put in place the last few years and now I can fully move over. It’s similar to Ireland, as people here are so friendly and salt-of-the-earth, and they love their beer just as we do in Ireland. The nicest difference to me is that people here really appreciate songwriting and love to hear what you have to say. They give music the respect it deserves, whereas in Ireland you are more of a parody act to provide jukebox entertainment for people to sing along and drink to. Which is fun for a while and you can make some money doing that, but longevity-wise it is not the best for your soul, so that’s why I love it over here. A.D.: What are the main themes on your new album “Rituals”? P.B. : Quite a few themes. The title track I wrote from the point of view of someone taking the road less traveled, following his passion, loving what they do, and not following the traditional route. I went to school, but I was never a huge academic, there was a lot of pressure to become a doctor, a lawyer – someone that makes a lot of money. I wasn't good at that and I love music. I became a musician and I listen to a lot of people asking me “when are you gonna grow up and get a real job?” All my friends are accountants, lawyers, whatever. I never wanted that. Money has never been a driving factor for me. I've always wanted to be happy and do what I enjoy. “Rituals” is about doing what makes you happy; you don't need to follow any sort of rules, as long as you're happy and are able to survive doing it. There are some love songs on there. I suppose there is a bit about anti-establishment; one song is about hipsterism and conformity. A.D.: What is your fondest musical memory? P.B. : After “the Voice” I got to do a gig at Vicker Street (Dublin) and managed to sell it out. I had lot of friends and family there, and a lot of people I didn't know. I had an amazing band full of musicians I'd grown up watching and they ended up in my band that night; it symbolically meant a lot to me. That was the biggest gig I've ever done. It was a crowd of people that were there just to see me, rather than at a party where I was in the corner. That, and of course, recording this new album, which was brilliant. A.D.: How does a Pat Byrne song start? Do you approach it from lyrics perspective or start it on guitar? P.B. : I normally sit on the guitar and mess around and if I find a riff or progression I like, I turn on voice memo and spurt out as many lyrics as I can from the top of my head. It might be complete gibberish but I'll keep singing for maybe 20 minutes. Then I listen back and pick out lines I like; the story starts to reveal itself, and then it starts to take form. Finally, I'll lock myself with a sheet of paper and try to write the verses and choruses. A.D.: What advice would you give aspiring musicians? P.B. : Try not to compromise anything. I made lots of mistakes in that regard, signed some contracts that weren't the best decisions. Write every day if you can, keep writing until you get something that you like, both of which I’m guilty of not following. A.D.: Do you get nervous before a show? Do you have any rituals? P.B. :I sit with the band, write set a list and that's about it. I don't lock myself and do vocal exercises or anything. I really look forward to my gigs; they're the highlights of my week. Tonight, was one of my favorite gigs as there was a full house listening to my songs. I get nervous, obviously as you're exposing yourself with songs you wrote, and it is a scary thing to do. Overall, I enjoy it so much, I have a beer with the band and get up there to do what I love to do. A.D.: What's the gear you can't live without? P.B. : I’m such a bad person to ask about gear. I only ever have a guitar and tuner; the guys are always talking about favorite amps and pedals. The guitar I have, I love, is a Maton, an Australian acoustic guitar. It’s great live, but not amazing when unplugged. I've never had a guitar that has been “my guitar.” I’m still in search for that. I want to spend money on a great guitar sometime soon. Honestly, I’m not hugely attached to any gear. As a musician that is an awful thing to say. I should have a guitar I can't be without, but I don’t. When I’m in Texas, I play my manager's Gibson J45, and I love that guitar, but it is not mine. I’m not that knowledgeable with sound, gear and such. My favorite way to perform is in somebody's room, unplugged with any guitar and attentive audience. P.B. : It is all about the raw materials, I don't think gear matters very much, if you have a great player on a guitar that you bought for forty dollars at a pawn shop, it's still going to be great. It doesn't matter if you spent four thousand on a guitar or a hundred thousand, you are what you are. It is all about your life experience and the raw materials you're given. Not that I have amazing raw materials, but that's what I value – to be able to sing and play a bit, not think about gear very much. A.D.: Your bio mentions that you went to University. What was your focus of study and did you finish your degree? P.B. : I studied Maths, Music and Anthropology. I had the best time in college, made lifelong friends, met my guitarist Steven who is here tonight playing with me. I had a great social life, was into all the events and entertainment, but I was never much of an academic; after two years I went on “the Voice” and that put an end to that. A.D.: What has the digital revolution brought for you? Have practices changed, record sales, audiences, the way you sell music, etc.? P.B. : It's a blessing as much as it is a curse. You have a platform in your pocket to promote yourself and you can do it anywhere, anytime. I utilize that as much as I can, but it also over-saturates everything and it’s very hard to be heard in a massive room of shouting people trying to promote themselves. Oftentimes you feel guilty about posting regularly on social media; I don't do it naturally as I’m sort of a private person and I don't enjoy social media very much. So anytime I post “come look at me, listen to this,” I feel a bit awkward. Spotify and things like that, as a consumer of music is amazing; your knowledge expands so much at a click of a button. Shazam is a great tool; if I like a song I can look it up instantly and then I’m a fan of that band – something that wasn't possible 20 years ago. It has also made it very hard to make money selling original songs, so you have to be on the road a lot more. It is a double-edged sword, but I think overall it is definitely good for music fans and the evolution of music. It is sad that music is more of a commodity; it is harder to make a living doing it now..
A.D.: How about practices? Are you working remotely with musicians? P.B. : At home in Ireland, I have a band who happens to consist of some of my best friends, so we meet regularly and have fun playing and singing together. I was on tour for three months before Christmas; I was playing with my best friends, my own songs, to people who wanted to hear my songs. We'll meet up maybe once a week for a couple of weeks until we have the songs where we were comfortable with them; then rehearsal is just gigging. The more you gig the songs in front of a crowd, the better you get. Since I've come here, we've only had one rehearsal, but the guys are so good they've listened and learned the songs off the record. This is the first full gig that we've done (January 10, 2019 at Mucky Duck). A.D.: Tell us about your recording process – how did you record “Rituals”? P.B. : It was all over the place. Once I'd written a song I went to Rich Brotherton (guitarist and producer, Ace Recording & Robert Earl Keen). My manager arranged for me to meet him and he's just the best guy, a wonderful person. He'd spend a lot of time in Ireland; he loves Irish music and Irish people and we just got along really well. We recorded, produced, mixed and mastered two tracks in his studio and then my visa ran out, so I had to go back to Ireland. I finished it at Windmill Lane, a studio previously owned by U2, a legendary studio. I got to do another four-five tracks there; once they were finished, I sent them to Rich and he added more guitar and mixed and mastered them. It took a lot of emails, phone calls, listening to mixes, saying I want to change this and that. I also recorded some of it at home. For example, I have a friend in Dublin who’s a great keys player, so I went to his house and we recorded keys for a particular song. I sent the recording to Rich and he added it in. It was by no means a conventional process, where I lived in a space for several months and just did it all there and recorded it. it was quite stressful, but it worked. A.D.: So how long did the full process go from start to completion? P.B. :I started writing in January, started recording in March 2018. I finished it October 2018 and released it in November 2018. It was high stress to get it done. But I think we pulled it off, I’m quite happy with how it sounds. Next time I'd like to do maybe one or two songs at a time, with a producer at a studio I really like and take my time and get the songs exactly the way I want them. Although I’m incredibly pleased with this one, as a musician you always try to grow. A.D.: What does 2019 have in store for Pat Byrne? P.B. : I am not sure what it has in store, what I hope...I've written bunch of new songs that I really love, and I hope I get to record as many of them as I can. I also hope to play as many festivals and meet some new musicians and songwriters and work with other people because it is my first year being an independent singer/songwriter, first time that I have something that I am really proud of. I finally feel confident approaching people as a singer/songwriter. On my last album I felt almost like a fraud because the songs were written for me. That's my main hope. In terms of commercially, I hope people would buy and listen to my music, I got more listeners and because of that I got more gigs. I'll be thirty this year, I always thought by thirty I'll be living in a mansion, when you're eighteen you think that.